Many cultures have some version of a meatball in their cuisine: sweet and sour Swedish meatballs, lion head Chinese pork meatballs with cabbage, fish balls in Viet phò, albondigas in Mexico and Levantine kibbeh. Although it seems the odds were against it, I do not come from a culture of meatballs. Southerners will eat the living daylights out of a sausage ball or a meatloaf, but I can’t really say those qualify as meatballs and in a household that skewed toward vegetarian, we didn’t eat them at home anyway. They were not part of my kitchen vernacular. When I learned to cook as an adult, I would occasionally dabble in meatball cookery, the odd broiled lamb and cherry meatball with saffron rice, spaghetti with meatballs every once in a while, but it just seemed like too much trouble to roll them all up, fry or bake them, and then mix them with the sauce. But then I cubed up some leftover meatloaf once and used it to make spaghetti sauce and I “got” it. I got the appeal of the Italian style meatball with sauce, seasoned, tender chunks of meat- not like a stew, not like ground meat. The meat was at once distinct from and at one with the sauce. I was in. I wanted more. So I set about making the best meatballs I could. And what it boiled down to was getting a technique I liked and layering a lot of complex flavor into the meatballs. Braising them made a huge difference for me. No more extra cooking step, no more lopsided meatballs, with hard edges. Braising, they cooked beautifully and tenderly, exchanging their flavor with the sauces, rich but not greasy and much, much easier. The real key for me though was in layering so much really good seasoning into the meat mixture that it was like a really glorious rich music chord- high notes of sweet tomato and fennel, sharp notes of capsicum and, deep down the mushroom and pecorino flavors, all seasonings that I pull from my pantry or refrigerator over and over to build these exciting and complex chords of flavor in the cooking. Harissa is a North African chile sauce. As far as I can tell, there is no a definitive formula for harissa; I’ve had harissa so hot I can only tolerate a few drops on my falafel sandwich and harissa that is thicker, made with some vegetables as the base instead of just peppers and spices. Each serves a purpose, but the second is a pantry staple that I always keep on hand to add a spicy earthy savoriness. It doesn’t add much heat, maybe just a subconscious tingle to your taste buds, but it isn’t as sweet as tomato paste so I often use a combination or harissa and tomato paste to create a broader flavor profile. I keep a tube of DEA harissa in the refrigerator all the time. 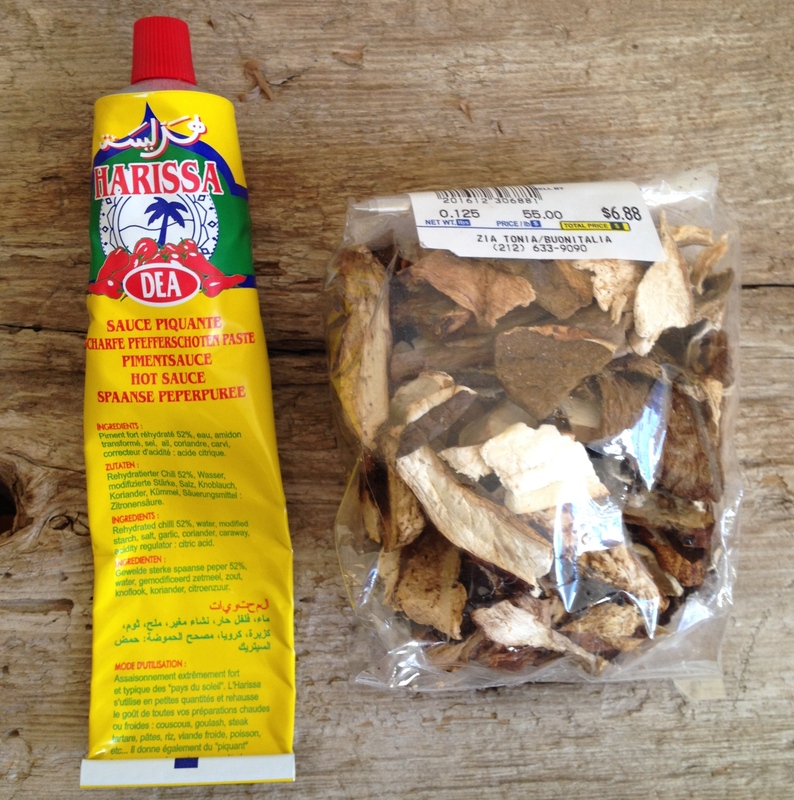 Another of my flavor must-haves is dried porcini mushrooms. A few dried porcini added to risotto or meat sauce or a vegetarian sautéed mushroom sauce just brings so much depth of earthy savory flavor. I soak them in hot water to rehydrate; after the mushrooms are removed, the water has a lot of flavor and usually gets added to the dish too. And finally, whether you are jarring your own homemade marinara sauce from farmers market tomatoes or you’ve found a brand that you love, a few jars of simple but flavorful tomato sauce are great to have on hand. I like a sauce with as few ingredients as possible, maybe a basic marinara or one with a little hit of capsicum heat. check the label though, a lot of commercial sauces have a lot of sugar, soybean oil, and other ingredients that don’t need to be there. Mix the meats, bread crumbs, mushrooms, and seasonings gently in a large bowl. mix the milk, egg and any leftover porcini soaking liquid, and incorporate into the meat mixture. Let the breadcrumbs soak up the milk and seasoning for about 10 minutes. Roll meatballs the size of the circle made by the tip of your index finger against the top knuckle of your thumb. In a large sauté pan or stock pot, place the meatballs close to each other but not touching in a single layer in the bottom. Pour marinara and tomato sauce over them just to cover and bring to a simmer. As the first layer begins to get firm, add another layer and more sauce. Continue this process until all of the meatball mixture is used. Cover with a lid and simmer gently for 20 minutes. 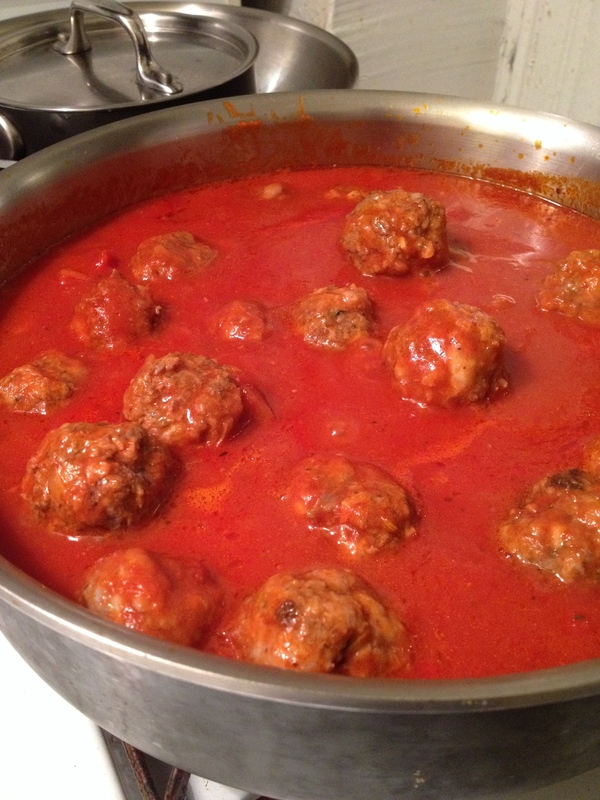 Higher heat can break up the meatballs and cause them to release more fat making a greasier sauce and a tougher drier meatball. If there is a lot of fat rising to the top, skim it off. I have found that a coarser more handmade style of sausage seems to be less fatty and I get less fat in my sauce, but a little of the seasoned sausage fat mixing into the sauce isn’t a bad thing in my opinion; you just don’t want it to be greasy. These meatballs are even better if made a day ahead, refrigerated in the sauce and then re-heated right before serving. 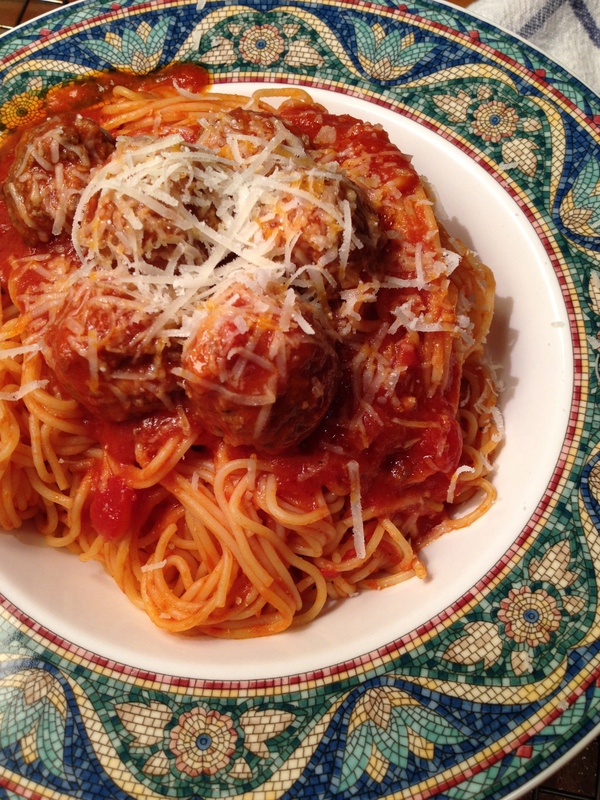 Toss some of the sauce with pasta, pile a few meatballs on top, grate on some more pecorino and enjoy! These meatballs also freeze in the sauce really well. I have a meat grinder and grind the beef for the meatballs at home. If you want to do this too, choose a cut of beef that doesn’t have large pieces of fat or cartilage, cut it into 1 inch cubes, and grind it on the small or medium grinder die. I’m really excited to try these! My husband will thank you when I do, I’m sure! 🙂 Thanks for bringing me into the world of sophisticated food!